Throughout the devotions, I will present many ideas on how you may apply what you’re learning to minister encouragement to others. I pray you will see the suggestions not as a list of “to do’s” (who needs any more of those?! ), but as “prompts.” Let the Spirit stimulate your thinking, but don’t let it stop with just thinking. As you read, make note of anyone who comes to mind. Then, “be diligent” and “make every effort” to minister to someone with encouraging words and deeds. 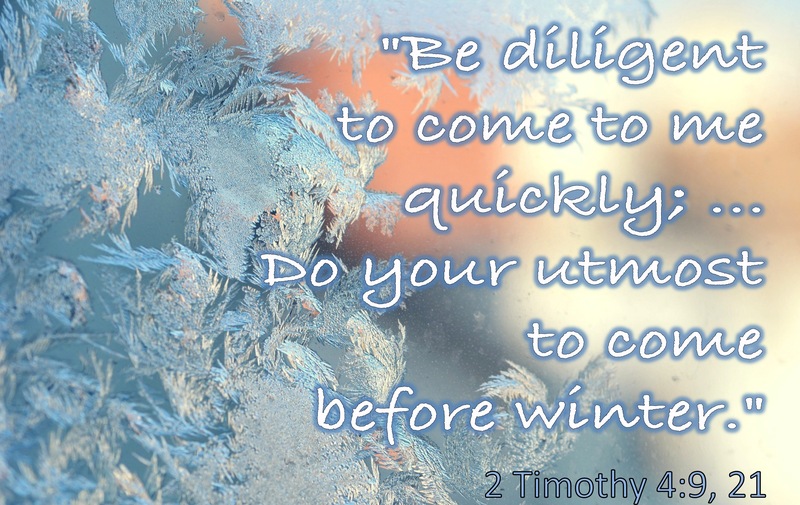 For this first devotion, it may help to get out your Bible and turn to 2 Timothy. All Scripture quotations are from the New International Version (NIV) unless otherwise noted. You might want to read the whole book (it’s a short one) before you read the devotion. Or, you may just choose to have it open for reference during your devotional time. Either way, I hope you enjoy the devotion! The Apostle Paul’s writings are so uplifting I don’t often think of him as someone who needed encouragement himself. Although, it does make sense. After all, he was often beaten, imprisoned, and bad-mouthed – both by unbelievers and by those who claimed to be of the faith. So, let’s look at Paul first as the encourager in order to gain insight as to how we might also be effective at this ministry even when we are experiencing hard times ourselves. Then we’ll look at Paul as the one in need of encouragement to help us recognize different ways others may need help. In 2 Timothy, we find that Paul is near the end of his life. He is in prison, still facing opposition, and many of his friends have deserted him. After all he has done for the church, he seems to be concerned that some people are ashamed of him. Yet, in the midst of all these trying things, Paul declared that the Lord was his sustainer and his deliverer. That Paul could stay so positive and focused on ministry during his own difficulties is something to consider as we seek to become encouragers. Paul did several things to maintain his ministry focus even when he himself was discouraged. First, he reminded himself of the truth of the Gospel and the end result of the Christian life (2:9,11,12; 4:8; see also Rom. 8:18-39). He also reminded himself of how God had helped him in the past (3:11). He reviewed and showed thankfulness (1:16-18) for how others had blessed him in the past (reminding me of his words in Philippians 4:8). And finally, he kept the needs of others in mind, even being willing to sacrifice himself for their sake (2:10). Following these practices of Paul, we can keep ourselves encouraged, so we can then be uplifting to others. As Paul said, we should bring the Word to others and encourage them both “in season, and out of season” (4:2). In other words, we should do it even when our own conditions are less than favorable. Once we’ve geared ourselves up to become encouragers, we then need to become observant of those around us, intentionally looking to find people who need this ministry. As with Paul, someone people might not come to mind right away because they seem to have things in their lives under control. So we have to ask God to show us the real needs people have, sometimes despite their outward appearances. Using Paul’s list of needs can prompt our thinking as to how we may help others this month. Paul had an obvious physical need – he wanted a coat because it was soon to be cold (4:13,21). Can you help relieve someone’s winter worries by giving clothing, paying a heating bill, or running an errand for a shut-in? Is there a ministry in your area you might partner with to meet such needs? Paul also had a spiritual need – to be reminded of the Christian’s ultimate victory as he struggled. Through cards, conversation or messaging, can you share the Word of God with someone to encourage them to persevere? Then there are his emotional needs – Paul repeatedly expressed the desire for understanding and companionship (1:4; 4:9; 4:21). Notice how he appreciated that one friend actually went out of his way to be with him (1:16-18). Paul needed to know that he still had supporters, that not everyone was ashamed of him. Can you go out of your way to spend time with someone who’s lonely? Do you know someone who might feel a sense of shame for what they’re going through? Your companionship can help them feel accepted and loved. And finally, Paul required help with his ministry (4:11). Can you come alongside someone to help in their ministry, even for one day or one task? Remember, you don’t have to do everything that comes to mind as you contemplate the suggestions for ways to lift the spirits of others. But it is important to be diligent in seeking such opportunities. The world needs more encouragers. Let’s do our utmost to go to those who need to be encouraged. And, let’s hurry, before the cold becomes unbearable! Next Wednesday, I’ll post the follow-up Bible study guide for this devotion. 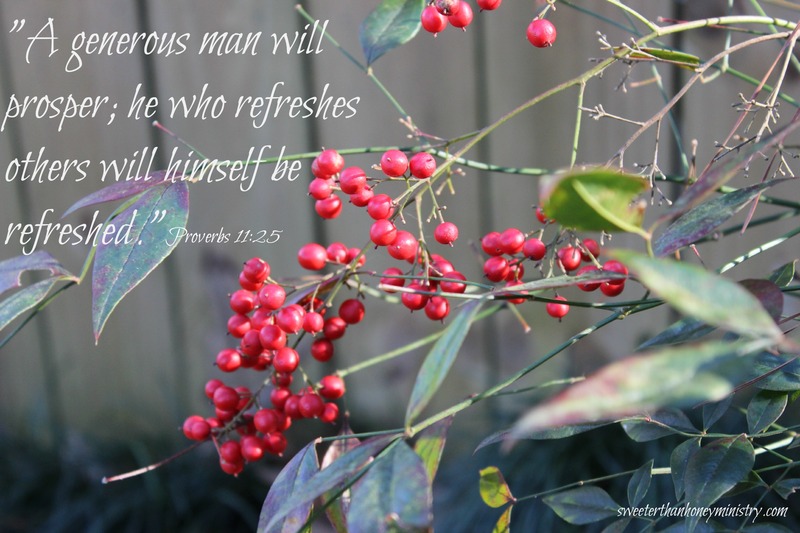 I hope you’ll continue to participate and let me know how you are finding ways to reach out to others who need to be refreshed.